CATBALOGAN CITY – To fill-up Samar’s dearth of police officers who will guard this year’s elections, the Philippine National Police Region VIII sent a total of 430 augmentation forces in the province Friday, May 7, 2010 at the PNP Provincial headquarters, Catbalogan City. Filled goal of the said grounding is primarily on the acquisition of clean and honest elections in the province of Samar. A delegation of some 430 policemen arrive Friday (May 7) at the Samar Provincial Police Office Headquarters as part of the answer to the continued election related violence and killings particularly in the 1st District of Samar. In a casual interview with the local press, PSSupt. Pancho Adelberto Hubilla, the Samar Provincial Police director confirmed that majority of the police officers sent in the province were from the regional headquarters, regional training centers and from the PNP Tacloban City. From a total of 430 men in uniform, 150 of which were unarmed. 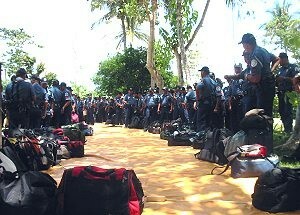 Hubilla clarifies that the 150 unarmed policemen were trainees only and did not receive (yet) any firearm orientation. He further unveils that these officers unloaded to administrative duties, will only have to be assigned on precincts near stations. To secure their safety, armed fellows would have to accompany them, he said. Besides making these coming elections peaceful and orderly, Hubilla also noted that the augmentation force is also geared up towards intensifying police visibility in the entire province of Samar so that partisan entries will be denied. More so, he points out that the 57% police fill-up of Samar police forces accordingly identifies a complete paucity of precinct guards. With additions of men from Leyte, he secures that Samareños will be able to receive proper police safeguard and that their votes would not be sent to ill compromises. In order to strengthen the said endeavor against poll upheavals, the PNP provincial officer fixed one police officer per precinct, but with additional men to be assigned on fixed posts and in roving duties. At most, the police officers would be signed-in for one week beginning on the Election Day itself. However, the PNP is not sole in propelling peaceful elections. The Armed Forces of the Philippines are also in sharp observance to partake critical duties in the elections. According to Hubilla, the AFP will become PNP’s partner in safeguarding precincts that are especially located in very remote areas, thinking that this unit is more capable of handling callous geographical situations such as rugged terrains and hard-to-penetrate forested localities. With regards to the financial agenda of the police officers, the PNP allotted a P1,100 subsistence allowance per capita. If arranged to be not enough, at least contingency allowances are backed up, he explains. If the augmentation strategy of the provincial PNP remains deficient, what the office will be doing is to do police assignments on areas that are more critically needy. This does not necessarily identify areas that are more populous, but areas that are more prone to partisan invasions and alien incursions. Particular localities mentioned by Hubilla are Calbayog City, Hinabangan and the Basey-Marabut region. The latter is considered being the most crucial area because it serves as the main gateway to Eastern Samar. BORONGAN CITY – Trust Smartmatic says Atty. Butch Beato COMELEC Provincial officer, trust in God and each other says Bishop Crispin Varquez of the Diocese of Borongan, Eastern Samar. Key officials assured voters of the province that elections on May 10 will push through. “We are updated and following instructions from the central office and as of this date there will be election on Monday”, provincial election officer of Eastern Samar announced during the forum organized by the Sinirangan Press Club last May 5, 2010 aired over the local radio stations. The pronouncement of COMELEC was supported by other key officials of the PNP, Philippine Army, PPCRV (Parish Pastoral Council for Responsible Voting), LENTE (Legal Network for Truthful Election). Provincial Election Monitoring Action Center has been activated by the PNP and Phil. Army adequately manned in order to answer election related problems and concerns and ensure peace, order and security. Col. Jaime Fernando Hidalgo, commanding officer of 14th Infantry Battalion based in Dao, Oras this province, and Police Senior Supt. Felixberto Castillo, PNP provincial director, informed media of their readiness to assist voters and agreed to publish their contact numbers for the people to have access in reporting elected related incidents and where voters can ask help when needed. Atty. Castor Gamalo of LENTE aired some apprehensions due to the reported failure to configure in counting the votes for local candidates by the PCOS machine, despite the assurance of COMELEC that SMARTMATIC already corrected and has already programmed the CF (compact flash) of the counting machines. Local media also expressed the same worries citing passed experiences of reported cheating manipulated unscrupulously by politicians or their loyal powerful supporters. Beato however explained that this time with automated process cheaters will find it difficult to defraud. However, the testing of these machines may come late but nothing to worry because SMARTMATIC will provide an expert to handle the machine, assured Beato. Bishop Crispin B. Varquez of the Diocese of Borongan in his pastoral letter and in an interview stressed to rebuild trust very important during this electoral process. He said, it is true that there were rampant cheating, vote buying and fraud but there is endless hope with the resurrected Christ. Let us not stop hoping and rebuilding trust rooted in our faith in God, bishop Varquez pointed out. Rev. Fr. Jay Romualdo representative of PPCRV encouraged voters to continuously pray for CHAMP Credible, Honest, Accurate, Meaningful and Peaceful Elections. He added that their group has been conducting voters education through seminars and conferences at the grassroots persuading voters to shade in that “bilog na hugis itlog” their conscience. Directory this election day through which reports, complaints and help needed by voters and communities maybe coursed; Provincial Election Monitoring Action Center 0927-2052942 PNP, 0916-6604000 Phil. Army, 0916-3440295 PPCRV, 560-9551 PIA, 5609353/560-9643 DYES Radyo ng Bayan Borongan, 560-9596 Radyo Natin FM. 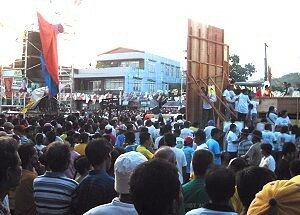 CATBALOGAN CITY – The grand rally for the local candidates of Samar formally took onset with Mayor Coefredo “Tekwa” Uy’s line-up yesterday, May 7, 2010 at the Catbalogan City Plaza grounds. The ceremonies began with a brief motorcade of candidates that roamed around downtown Catbalogan. Campaign vehicles armored with candidacy posters struck most of the parade’s façade, with theme jingles of each candidate sounding the event. By dusk, running politicians began laying their speeches on the stage of the Catbalogan City plaza. In front of approximately five thousand listeners, the grand rally unfolded with the words of Mayor Tekwa’s city councilors. This stringed with Rodolfo “Rudy” Aquino, Teodoro “Teddy” Ilagan, Ernesto “Erning” Arcales, Joselito “Ting” Mendoza, Manuel “Tawi” Correche, Rodrigo “Jun-Jun” Perez III, Maximo “Max” Pescos and Mayor Uy’s daughter herself, Stephany “Step” Tan, respectively. Opening acts were mostly on the introduction of the candidates themselves with platforms practically going behind. Most of their plans for the city targeted on educational, medical and barangay-related developments, with Mendoza accentuating concerns on improving infrastructure of each barangay. Correche on the other hand, stressed out medical plans so as to bid answer from Catbaloganons’ long cry for quality health care. To support Mayor Uy’s candidacy to regain his post, the Sangguniang Pambarangay representative Brgy. Estaka-Buri Capt. Rafael Muñoz stirred a detailed talk of his mayor’s past accomplishments and political ingenuities. He disclosed Mayor Uy’s projects as the city leader in building or improving several important infrastructures such as the city market itself and the sustained establishments of business entities in the city which were propelled due to heavy influx of tourists. Further, Muñoz also flaunted that in the period within Mayor Uy’s regime, local bank deposits were also increased, resulting into Catbalogan’s ranking as the third biggest bank depositor in the region behind only Tacloban City and Ormoc City. Muñoz represented 54 out of 57 baranggays in Catbalogan. Additionally, Muñoz talked about Mayor Uy’s plans of realizing the dream of building a city hospital and city high school for the residents of his jurisdiction. Next in line, congressional candidate Van Torrevillas capped the slot. Beginning with his introduction as one of the 20 icons of the youth under the National Movement of Young Legislators (NMYL) and as the National President of the Philippine Jaycees, he surrendered his platforms with several project proposals. He plans to improve the fishing industry of the second district of Samar by putting up ideal fishery schemes as well as to provide scholarship grants to our most deserving students. He also wants to support the rural health units by giving them proper medical equipment and free medicines. On his first one hundred days in office, if given the chance to win, he’d like to do a meeting with local politicians from various municipalities of the second district of Samar. According to him, he would try to coordinate with these political entities so that he would be able to dissect the problems of his district from the most local level. Candidates as Board Members held the next junctures of the grand rally. Beginning with Felix Hilvano, Kenneth Mark Perez, Eunice Babalcon, Jimmy Dy and commencing with Pablo Cinco, the party would like to address their concerns on health issues, most critically. Fueled with criticisms against the present gubernatorial administration, the candidates emphasized the province’s lack of proper medical assistance. They criticize, particularly, the hospital for having no improvement since time immemorial. If only given importance, the provincial hospital could have not been as ill as its patients. Furthermore, the board members also unlocked issues on corruption against the incumbent Gov. Milagrosa Tan. They opened allegations on budget graft and threw clamors against her unjust and crooked administration. Eunice Babalcon, besides advocating health care, also put emphasis on services that the provincial government may extend to our youth and women. She plans to create moves and advocacy campaigns that will protect and make these particular sectors of the society dynamic. In response to the grueling situation of Samar, Gubernatorial candidate Casilda Lim and Vice Gubernatorial candidate Nancy Rosales shared the same visions with their board members. They also targeted health care as their primary concern and branched out with advocacies pertinent to infrastructure and provincial developments. The grand rally commenced with Vice Mayoral candidate Art Gabon and re-electionist Mayor Coefredo Uy. Main points that they enlisted on their speeches were on the developments they offered and they can offer to Catbaloganons. In particular, they flaunted expert poverty reduction schemes for the city residents including the approval of the 4PS (Pantawid pamilyang Pilipino Program) grant to more or less 1,500 impoverished Catbaloganons that were said to have been brought up through the efforts of the mayor. More so, they also envision Catbalogan as an industrial and tourism hotspot for Samar. With the Philippine International Eco-Show (PINES) of DTI heading their way, they plan to put up power-related projects in certain areas of the city and create an intra-island tourism loop in the province of Samar. With these projects, they foresee economic developments in the city, including more job oppurtunities and the building of several establishments for the people. Intermission numbers, such as music interpretations and dance acts alternately intervened the rally but speeches coming from the candidates were the primary attractions of the night. The event was also covered live on television by Decobeam Cable TV services so as to give home-based conveniences to Catbaloganons not present in the grand rally. TACLOBAN CITY – One of the more populated schools in Leyte – the Palo National High School – saw to the inauguration of a two-storey six classroom building that amounts to at least P4.8 million. The new school building means conducive learning environment for the increasing number of students in public schools says Leyte Governor Carlos Jericho Petilla who led the inauguration of the new school facility in Brgy. Cavite West, Palo, Leyte. The governor said the Palo National High School was given priority by the provincial government of Leyte through the funds from the Provincial School Board as it already has more than 2, 000 population. “In the DepEd category, that population would already warrant a ‘red flag’ that means more than 50 to 60 students in one classroom,” Gov. Petilla said. He said that prioritizing ‘red flag’ schools is part of the province’s efforts to lessen the number of direly needed classrooms all across the various public schools in Leyte through a cost-efficient manner. The project also is seen to reduce the disparity in net enrolment and completion rates by improving the quality and relevance of secondary education in target public elementary and high schools in the province. “There are many schools in the province that are requesting for additional school buildings but we have to prioritize those that need the most,” Gov. Petilla added. The new school building inaugurated is complete with toilets and lavatories for proper sanitation of the high school students. It has been observed that among other public schools, there are no proper toilets and comfort rooms for students’ use. To recall, Leyte’s pubic schools have enjoyed the support of the Secondary Education Development and Improvement Project (SEDIP) funded by the Japan Bank for International Corporation (JBIC) that saw to a number of school buildings constructed in various public schools in the province. However, the project has already concluded some years back. Meanwhile, the governor encouraged local municipal and school officials to maintain the building so that it will last longer like the other old schools. BORONGAN CITY – Eastern Samar Commission on Elections (COMELEC) Provincial Supervisor, Attorney Butch Beato allayed fears of “No Election” amid the problem on defective flash cards. “A car owner with a flat tire or radiator will not discard the whole vehicle, but instead buy a new tire or radiator to replace the defective ones”, Atty. Beato simplified the matter in a media forum held Wednesday at Radyo ng Bayan, DYES. “We will hold the election as scheduled, since I for one haven’t receive any information yet whatsoever regarding rescheduling, or anything for that matter”, Beato added. He clarified though that since the contracted forwarder has committed to bring in these election gadgets and other paraphernalia to the precinct level, COMELEC’s responsibility commences once these have all been received by the board of election inspectors (BEIs), otherwise, it is still Smartmatic’s and their contracted forwarders and handlers. Short to say that defective or not, these paraphernalia would not be accounted to them, until after receipt of the BEIs. But Beato asked the public to trust in the automated polls, because this has long been the dream of the people if only to prevent fraud and other manipulations so to speak. With the COMELEC, the Philippine National Police and the Philippine Army likewise assured the public of an honest, orderly, peaceful elections. PNP Police Provincial Director Felixberto assured that the COMELEC gun ban is still in place and security and assistant desks have been established at precinct levels. Col. Fernando Hidalgo of the 14th Infantry Battalion also said that whatever security plans they have set for the May polls are now being executed by them. Reverend Fathers Ray Romualdo and Michael Rebamontan, both representatives of the Parish Pastoral Council for Responsible Voting (PPCRV) enumerated the several activities they engaged in, in preparation for the election (voters’ education, trainors’ training etc). They even cited their effort to look for and invite volunteers to their Council adding that the 1,500 plus volunteers who have checked-in might not be enough for the enormous task ahead. Asked about poster and tarpaulin violations, Atty. Castor Gamalo of the Legal Network for Truthful Elections (LENTE) frankly replied that no courageous complainant have come forward even if several violations are glaring and apparent. To cap it all, as gathered from the COMELEC, PNP, PPCRV, LENTE and the Army, Eastern Samar is all set for the first automated polls this coming Monday. TACLOBAN CITY – With barely days to go before the first ever Philippine automated elections, Leyte Governor Carlos Jericho Petilla revealed that he is throwing support for Senator Mar Roxas as his vice-presidential bet in the May 10 polls. Gov. Petilla, who is known to be an ally of the administration, announced his endorsement of the vice presidentiable through plugs aired over local radio and tv stations aired for the first time last Monday. The governor’s endorsement is said to widen more the bandwagon of support for Liberal Party vice-presidential candidate Roxas who is reportedly still topping the various pre-election surveys. The endorsement came as other major sectoral groups and regional political giants endorsed Roxas’ candidacy. According to Gov. Petilla in a media interview Roxas is the only vice-presidential bet who has the political will, experience, clean track record and the determination to help the country move forward. “He is so far the only candidate in the vice-presidential race who has expressed support to various programs that the province and the provincial government are placing in line for the people of Leyte,” Gov. Petilla. One of this, he said, is the ICOT-Rice project which the province is implementing to improve rice output of marginal rice farmers in the area. The governor expressed confidence that Roxas would be a credible partner of the next president of the country in uplifting the lives of the Filipino people and in reviving the image of the country from the stigma of corruption. Meanwhile, farmers’ groups based here in Leyte also expressed support to both the presidential and vice-presidential bets of the Liberal Party who promised to secure the votes of more workers and farmers groups for the two senators. The groups are reportedly backing Liberal Party candidates’ after they committed to reforms and good governance and their promise to ensure the full implementation of the CARP extension with reforms (CARPer). MANDALUYONG CITY – Seven Greenpeace activists have been arrested following an action this morning in which they “slept in” at the campaign headquarters of presidential candidate Gilbert Teodoro. The action began before ten in the morning today. Police began the arrests inside Teodoro’s headquarters before noon. The group were among Greenpeace volunteers who this morning visited the campaign headquarters of Teodoro, as well as of Noynoy Aquino, which are both located along EDSA, in Mandaluyong City, to call on both candidates to commit to water protection measures during the first hundred days should either of them be elected into office. “The response to our action this morning by Gibo Teodoro’s camp is unwarranted and extreme. We hope that this is not a preview to how his administration will deal with peaceful protest--especially over legitimate and urgent public concerns,” said Francis dela Cruz, Greenpeace Southeast Asia campaigner. “The next president of the Philippines simply cannot ignore the issue of climate change while our country suffers from its growing impacts year after year. Both Gilbert Teodoro and Noynoy Aquino are among those who have yet to take a clear stand on this issue and outline clear steps on how they plan to steer the country from more disasters. Greenpeace is asking for their commitment to securing the future of the Filipino people. Today’s action took this message directly to their campaign headquarters,” he added. Activists who participated in the action this morning wore masks of the presidentiables and “slept” on cushions placed upon mats depicting the cracked soil of agricultural lands dried up by El Niño. The group of volunteers who visited Noynoy Aquino’s headquarters are still in the said office negotiating to get Aquino’s commitments. Since March, Greenpeace has been calling on presidential candidates to commit to climate change adaptation measures, culminating with the Water Watch project which was launched in April 12 in Angat Dam. - Create a special fund for research on non genetically-engineered drought-resistant crops, innovative farming techniques and technologies that minimize water consumption. 2) Improve the existing capabilities of monitoring teams to develop efficient forecasting and warning systems for extreme weather events that are critical to protecting lives, property and critical environmental resources. This includes engaging the academe and NGOs to be partners of PAGASA in data-sharing, weather monitoring and forecasting; and directing the MMDA and the DPWH to de-clog Metro Manila storm drains by August 2010. The drought images were gathered from the Greenpeace Water Watch project that had established a week-long camp at the Angat reservoir from April 12, and the mobile Water Watch station that had expeditions into drought-stricken agricultural communities in North and Central Luzon. MANILA – In yet another disagreement with some Catholic leaders, 72% of Filipinos believe that the Department of Health’s promotion for correct and consistent use of condom for the prevention of HIV and AIDS is beneficial for the country. In a press conference held Tuesday, SWS President Dr. Mahar Mangahas, presented to media the latest Social Weather Stations (SWS) findings on the perception of the Filipino people on HIV and AIDS. Conducted nationwide from 16-19 April 2010, the same survey also revealed that majority of Filipinos (67%) agree in the Department of Health’s earlier pronouncements that HIV and AIDS cases in the Philippines is increasing. “This survey only shows that Filipinos still trust the Department of Health in matters related to public health,” said Ben de Leon, President, The FORUM for Family Planning and Development, Inc. The Department of Health particularly DOH Secretary Dr. Esperanza Cabral earned the ire of the Catholic church when she launched an all out campaign to address the rising cases of HIV in the Philippines. Her campaign included a more aggressive awareness raising and condom distribution. While certain leaders of the Catholic church called for her resignation, various Civil Society Organizations (CSOs) rallied behind her. “We wanted to show proof that the Filipino people are behind the DOH and Sec. Cabral that’s why we commissioned this survey.” de Leon said. According to the Philippine National AIDS Council (PNAC) and the DOH, cases of HIV cases in the Philippines has reached alarming proportions with 2 new cases being reported each day or 60 new cases per month. The latest SWS survey also shows that 7 of 10 Filipinos regardless of social status and educational status from both urban and rural communities believe that the condom distribution of the DOH is beneficial to the country. CSOs like the FORUM believe that conservative Catholic organizations and Catholic leaders are going too far in asking for Cabral’s resignation. “If they can’t offer intelligent and fact based solutions to our HIV/AIDS problems, I think these personalities from the Catholic church should just step aside and let DOH do it’s job. If you can’t be part of the solution then don’t be part of the problem. The Catholics have spoken and this SWS survey is proof.” De Leon added. MAASIN CITY, Southern Leyte – In a fellowship dinner, Friday with the Philippine National Police (PNP) Southern Leyte Provincial Office led by Provincial Director Pepito Pacada, the government and private media committed to support a clean, honest and orderly elections come May 10, 2010. Pacada encouraged the media to be part of the national activity, and ”join hands together to have an honest, fair and peaceful elections.” That the media should document anything seen wrong or something that violates the law so that spot corrections will be done, he said. He disclosed that there are only 463 men in uniform who are ready to monitor the May polls throughout the province, that excludes the Armed Forces of the Philippines (AFP). There are coordinating centers identified by the PNP in each municipality, which can receive any information pertaining to the elections, he further disclosed. There’s no hot spot considered here in Southern Leyte, only a special area that needs special concern, the municipality of Liloan, he informed. “Liloan falls under category 1, because of its history of election-related violence, augmentation of forces has been already acted to closely monitor the area,” Pacada reported. In the dinner hosted by the PNP, Pacada also relayed the absentee voting conducted last Thursday, April 29 where 21 military men casted their votes in Maasin City, in the presence of the Comelec and the PNP. It was learned that covered by the local absentee voting are around 21,000 government officials and employees as well as members of the military and police who will be on election duty in places where they are not registered on May 10, Election Day.